On Saturday, March 25, 2017, the Kingsport Police Department’s Chief of Police, David Quillin, appeared before the Commission on Accreditation for Law Enforcement Agencies (CALEA) in Mobile, Alabama. Chief Quillen accepted the “Meritorious Advanced Gold Standard with Excellence Reaccreditation” on behalf of the Kingsport Police Department. This award is reserved for agencies that have been continuously accredited for 25 years or more. The Kingsport Police Department has now been successfully through the accreditation process eight times. First accredited through CALEA in 1992, the department has since maintained accreditation for a quarter century. “CALEA Accreditation continues to give the Kingsport Police Department the ability to hold our facilities, our policies, our individual officers, and our department as a whole to the absolute highest standards of professional law enforcement services,” said Chief Quillen. CALEA Accreditation requires proof of compliance with 484 highly regarded and broadly recognized professional law enforcement standards. The standards help law enforcement agencies to strengthen crime prevention and control capabilities, formalize essential management procedures, establish fair and nondiscriminatory personnel practices, improve service-delivery, solidify interagency cooperation and coordination, and boost citizen and staff confidence in the agency. 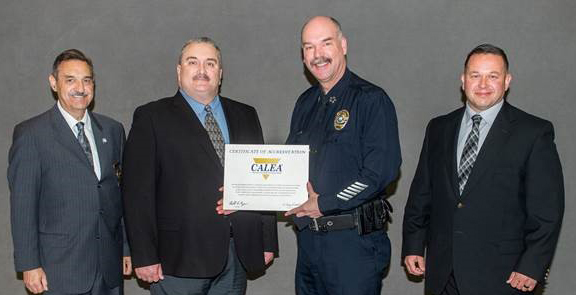 The major benefits of CALEA Accreditation include greater accountability within the agency, reduced risk and liability exposure, stronger defense against civil litigation, staunch support from government officials, and increased community advocacy. For additional information regarding CALEA Accreditation, please visit www.CALEA.org.